Xmas Bob Mackie Barbie Giveaway! I promised all of my readers an amazing Christmas giveaway and I am so excited to introduce you to Bob Mackie’s new and wonderful creation, The Countess Dracula Barbie! I have been a fan of Bob Mackie since I was a little girl obsessed with Barbie’s. It wasn’t until I got older that I realized most of my favorite dolls were designed by him. Once I realized who he was and did my research, it was no question we were cut from the same cloth. What I mean by that is…He said something like “A woman who wears my clothes is not afraid to be noticed.” As I mentioned in a previous post about my visit to the Mackie showroom, I am most certainly not afraid to take risks with fashion or be noticed. This man creates beautiful gowns for exhibitionists like myself who don’t care to fit molds so it is no question why the Barbie corporation has had him design beautiful Barbie’s like this one for ages. Mackie’s incredible designs have helped establish the collector Barbie doll market, and helped rank dolls as the second most popular collectable in America. I would know, I had most of his Barbie’s when I was little. I loved Barbie but it was the fashion that had an effect on me that eventually snowballed into the style I exude today. I am sure I am not the only woman who grew up loving/being influenced by Barbie or Bob Mackie which is why I am glad I can share this gift with one of you lucky ladies. As my Christmas gift to you, one very lucky doll is going to receive Bob Mackie’s stunning Countess Dracula Barbie. This doll is one of my absolute FAVORITES. 1. She is a vampire 2. her outfit is incredible. She is so badass and I couldn’t expect a better creation from one of my favorite designers. Forever young and eternally beautiful, this royal lady’s ensemble features a magnificent pannier skirt lined with metallic red-woven fabric, an enchanting collar and soaring headpiece encapsulating four-inch high fiery red hair. She has clear teardrop rhinestones that sparkle on her earrings and also accent her red and purple Louis-style shoes. Once bitten, and never shy! 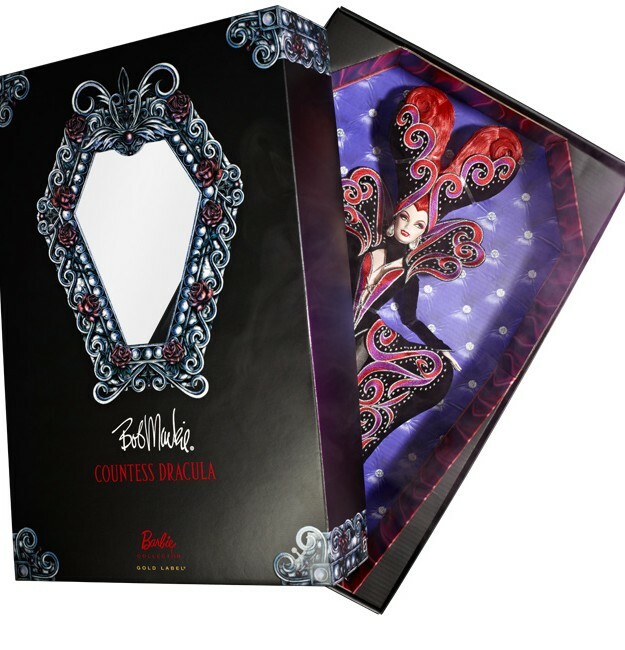 To win Bob Mackie’s Countess Dracula doll follow him on twitter and let us hear how Barbie or Bob Mackie has influenced you. Comment here and let me know. Visit the Bob Mackie website to learn more about his work! 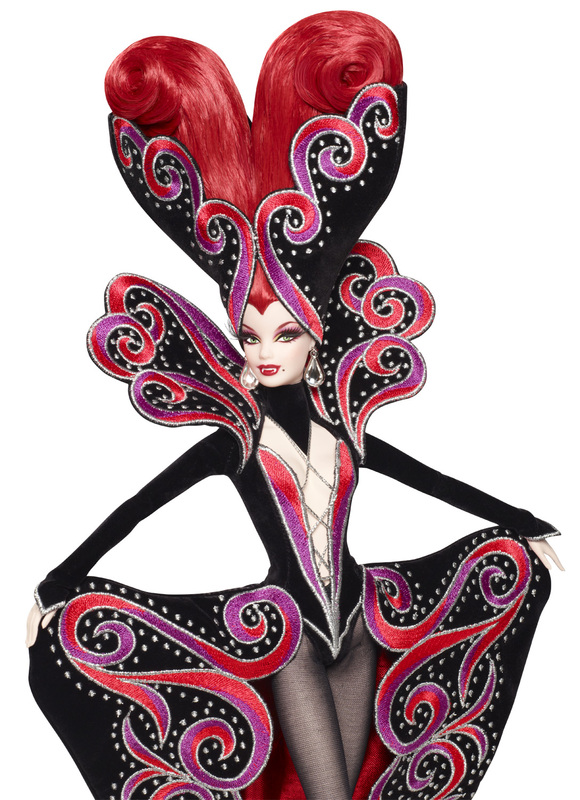 Visit the Bob Mackie shop for art, dolls, apparel, and home furnishings! This doll is sold out all over the country, It is limited edition and only 3,200 were made! Giveaway ends Jan 1, 2012. May the best doll win! ← Celebrate Xmas early with Iron Fist! Oh my gosh, what an amazing giveaway, that Barbie is incredible!! I see the word Barbie and I still get excited. 🙂 Back in the day, playing Barbies was my favorite past time. I can still remember how exciting it was to get a new Barbie, admiring the packaging and all of her accessories through the plastic window, painstakingly untying those tiny plastic twisties that held her against the box, and finally getting her out and loving how perfect she always looked. I spent countless hours playing barbies with my little sister, we’d take over the whole bedroom floor and get lost in our own imaginary world, each Barbie got a name, a personality, a history, a love interest… I loved all of the outfits, all the detail, all the accessories, the tiny appliances, everything about my barbies. Where they influenced me the most however, was probably in inspiring my love for decorating and my love for fashion. One of my favorite parts of playing with Barbies was creating fully furnished homes and bedrooms for them. I never had any of the big dream houses, I would use things from around the house in addition to the accessories and appliances I did have to make bedrooms to fit my Barbies to enhance our detailed story-telling that revolved around them. And I think it almost goes without saying; but Barbie had the MOST fabulous wardrobe ever. As a young girl, how could I not be inspired by the endless clothing options? I so loved getting new barbie clothes, I loved how they were packaged individually and always came with accessories. Looking back, I see how being exposed to all the different clothing, even though it may have been in miniature; influenced me-to this day, there are still specific Barbie outfits I remember perfectly. When I saw this giveway, I knew I had to try and win. As a child, I played with Barbies but this giveway isn’t about me. I really want to win this for a friend who is a huge collector of Barbies. She has a few of the Bob Mackie barbies but I know she would absolutely love this and be excited to add this to her collection. Just a few weeks ago while at her apartment she showed me a few of her Barbie collection and the smile on her face as she opened each box is fun to see. It’s like watching a kid at Christmas. She is currently in school for nursing which is very stressful and overwhelming at times. I know this gift would mean so much to her. While I’ve already given her a christmas gift, her birthday is in February and this would be the ultimate gift. I would have to keep this a secret which may be hard hahaha but worth it. I’m going to keep my fingers crossed for this one. Thanks for posting such an awesome giveway! Oh my goodness this is AMAZING. Both Barbie and Bob Mackie influenced me when I was younger and now as an ‘adult’. As a child, I would just stare and look at all the intricate details that the dolls had. I would think, this is a doll but there is so much more to her than meets the eye and was amazed by how someone could imagine a doll like this and create it. I had so many Barbie’s and wanted to dress them up and give them each a personality and bring them to life. She’s confident and has an edge. I have read almost every book written about Barbie and her creator, Ruth (the Brooklyn Public Library knows me well). Ruth’s persistence in what she believed in influences me everyday and reminds me to keep working toward what I love to do. I’ve been influenced by Bob Mackie by stepping outside the box in terms of my imagination and style. I would take inspiration from one of the many beautiful dolls he has created, and attempted to create my own everyday version of it. He also influenced some of my art; the colors I would use, and the feel of the drawing or painting would reflect that of the Barbie I would see, vibrant and detailed pieces with an edge. This is so awesome!! How amazed my friend who just had her Vintage photo pin -ups done & published in her first magazine spread would be to receive this as a congratulations gift!! I am following on Twitter as @ShariAlligood & left Bob Mackie a tweet! @BobMackie Barbie was an ultimate go to present for me to give my daughter especially when dressed in your designs!! I have always loved the Mackie Barbies and was thrilled when I received my first one. The Mackie Barbies are amazing! I have a couple and I love them. Barbies are great models and I have dressed several, even earning ribbons at the county fair. I follow him on twitter! And I use to play with Barbies for countless hours when I was young and loved collecting them. I also dug the retro Barbies most and the way the same doll was so versatile and made to so many things and had so many different looks and designs. Three generations of Barbie dolls I have so many memories. My favorite is going into the King of Prussia Mall for her birthday and buying her first a barbie doll. I love buying Bob Mackie clothes from QVC. It would mean the world to me to have a doll to display in my home with his work. I played with barbies on my front porch with my bff. We played for hours with those dolls. Unfortunately when you play with the dolls they do not stay in good condition. I would love to rebuild my collection starting with one of my favorite designers. Thanks for this opportunity. Like everyone else, Barbie reminds me of childhood. But I always envisioned her as a good role model. She’s not your average woman. She can be a mother, doctor, stylist, the president, or even Miss America! She lets all girls know that they can be anything they want to be despite their color/race/ethnicity. As a little girl, even while playing house, I wanted to be like Barbie so I had my own pretend little family, a career as a designer, makeshift big house (made out of blankets, chairs, and pillows), and car (made of cardboard boxes). And now, I’m working on making those dreams come true. P.S. I’m also following Bob Mackie on Twitter. Happy Holidays, Jasmine! This is a great Christmas giveaway! I will keep it brief, since I could remember I have been a Barbie fan and that’s one of the reasons why I decided to persue fashion design. As I got older Barbie was the only girly thing about me and has stuck with me. Bob mackie is one of my favorite designers especially for Barbie and inspires me more and more as the years that go by to go back into designing again. Barbie has come such a long way with her clothes and the detail is mind blowing. Because of Barbie I love being me! As far as I can recall, barbies been the only girl toy I had that really meant something to me. When I was small my parents never had extra cash to buy us toys or spoil us but some how they managed to get me a barbie that I really wanted one year. I believe it was the L.A. Gear one with inline skates that flashed sparks. I was the happiest kid on the block that day:) Now my hubby, still to this day, goes out of his way for the holidays to buy me that special gift *wink*. Such a wonderful idea for a give away. I am a fashion designer here in NYC and Bob Mackie has to be one of the most inspiring people I have ever had the honor of meeting. I have recently started a blog (www.hiremebobmackie.com) to show him how much I admire and respect him, also it’s a shameless way to beg for a job! I could wax poetic about him and his career for hours on end. His talent at times is boundless and awe inspiring. His influence is apparent in the design work that I do both professionally and at home. Encrusting everything in rhinestones and sequins takes forever but it looks so amazing – or as I say amazBLING! I love his use of bold colors and techniques to make the wearer into a living work of art! Bob Mackie and his collaboration with Barbie has been a memory for as long as I can remember. My parents would get the Sear catalog and I remember being obsessed with the Neptune Fantasy Barbie. I would study the photo for hours and draw my own versions. Every time a new catalog would arrive I would flip though quickly to the toy section hoping for a new Bob Mackie creation. I remember when the Jewel Essence Collection was released and they would run those full length info-mercials with Mr. Mackie speaking to the host about each doll in detail and the designs for them. I swear I watched the entire thing about 10 times. I never did get any of the dolls since I was so young but my boyfriend just got me the Diamond Dazzle Barbie for my last birthday! It brought me right back to middle school! Winning Bob Mackie’s new doll would be wonderful but it is great to share these stories and read everyone’s perspectives on Mr. Mackie’s work. I must say that this is the only post that I hate right now. Knowing that I can’t enter this contest because I am her mother brings great pain to my heart. Oh! How I would have loved to add this doll to my Barbie collection. I can only hope that this doll goes to someone who really appreciates her the way I would have. Good luck to you all. Philip’s story was SO inspirational. What a story! Barbie is definitely a huge piece of most young girl’s childhood. I know I grew up always playing with barbies. Barbie brings universal happiness to all girls. I remember the day I realized they made collectible barbies. I’ve toyed with the idea of collecting barbies like this one because they’re so beautiful and amazing. I remember visiting FAO on 5th ave and drooling over their barbie displays and thinking how awesome it would be to own one of them or a few. I really wanted Bob Mackie’s golden legacy barbie when I first saw it because I’m obsessed with anything gold! I still have my 70’s cher doll and her Bob Mackie outfits! My favorite of all was the head-dress. I love all things vamp this would be perfect to put next to the Cher doll in her Mackie gear! Barbie has influenced my life since I was a little girl. I’m literally obsessed with Barbie to this day! I’m now 20 years old, and my room at my parents house was just finished with the original Barbie sketches- framed artwork, bedding, curtains, etc. I also think that Barbie has a strong influence for girls/women teaching them values and character. I have learned poise, confidence, fashion and the importance of carrying oneself with dignity and grace thanks to Barbie. A lot of my friends tell me that I look like/ act like Barbie and honestly, I that is the greatest compliment any young woman could ever receive. I have been a fan of Barbie and of Bob Mackie for what seems like forever. My Barbies were probably my favourite thing to play with when I was a child, and I have passed that love of Barbie on to my daughter, who has quite a collection of dolls lining the walls of her bedroom. As for Bob Mackie, I know he has created designs for so many celebrities, but in my heart I will always think of him as the man who made all those fabulous gowns and costumes for Carol Burnett. One of his best known costumes created for Ms. Burnett was the inspiration for one of my favourite Halloween costumes. Although the curtain rod made it difficult to walk down the hall without taking people out. If I win this fabulous doll I would give it to my daughter. It brings together so many of the things she loves – vampires, Barbie, fashion and, of course, Bob Mackie – in one pretty impressive package. I follow Bob Mackie on twitter using the account @BarbieGirl0420. Both Bob Mackie and Barbie have influenced me because they are both style icons. I love so many of the things Bob Mackie has designed, especially things he’s designed for Cher. Seeing his designs makes me want to add more spice to my own wardrobe! And being an avid Barbie collector, I love all of the Mackie Barbie dolls. Barbie has been a major influence because even though she’s a fashion doll, she has had so many different careers over the years. She makes little girls believe that their dreams can come true and that they can be whatever they want to be. That’s my favorite thing about Barbie. I got my FIRST Barbie in 1962!! She has a blonde bubble hairdo. In fact I still have her. She has been my friend for many years. When I was young I was a chubby child. Some of the neighbor kids would pick on me and not let me play games with them. I actually didn’t care because I had my Barbie to keep me company. I could tell her secrets and she NEVER told them to anyone. We had a large Weeping Willow in our backyard. I would sit under it on a blanket and play Barbies for hours on end. My Mom would sew clothing for Barbie and she had a Fabulous wardrobe! I carried her around in a black patent Barbie case. Now I enjoy seeing my daughter interact with her Barbies. It takes me back to my childhood and I love that. P.S. I am following Bob Macke on Twitter! I love everything Bob Makie creates. I Need a new closet because of his designs. I think having this doll would be “the bees knees” Love you Bob. This doll is AMAZING. Love everything from the makeup, to the hair, to the elaborate costume. Everything about this doll just screams BOB MACKIE, and I love it! Bob Mackie is inspiring because his artistic vision is always beautiful and full of rich color and design. This Barbie is gorgeous and really does well with fitting both the Barbie and Mackie image. Thanks so much!